Angus beef cattle, Romanian natural grasslands and Swiss expertise – these are the first-rate trademarks of Karpaten Meat Group Romania. We produce top-quality beef from Angus cattle that we breed on natural Transylvanian grasslands. The purpose of Karpaten Meat Group is to lay the foundation of a premium Angus beef production network. We have set the tone for the Angus beef business in Romania. Join the largest Angus network and become our partner. Top Angus genetic is developing together with Karpaten Meat Group. The farms of Karpaten Meat Group of are located in Sibiu county and comprises the following units: the Aberdeen Angus breeding cattle farm, the fattening farm, the quarantine and import/export farm. The total cattle population of our farms is of about 7000 head and consistently growing. For the past years we have successfully implemented the breeding, fattening and sales of Angus cattle, as well as the sales of Angus beef – as a complete system. The project of creating an Angus beef business started in 2008, when its founders decided to give a chance to Romania’s boundless natural potential, with ideal conditions for the production of premium Angus beef. Do you want a profitable business? START WITH A GOOD AND COMPETITIVE GENETICS! Karpaten Meat offers for sale maiden heifers, open heifers, bred heifers and breeding bulls, both from its own farms, and imported. We also offer integrated solutions for your business, and a range of services, such as the opportunity to select the desired bovine animals from a group, logistics, consultancy in Angus farm management, services to help you create an Angus cattle business or to consolidate your current business. Almost the entire current Angus genetics in Romania has been acquired by our partners across the country from Karpaten Meat Group. As a result, with constant support from Karpaten Meat Group, Romania has witnessed the development of Angus farms with valuable genetics. Premium Angus beef starts on Transylvanian grasslands. 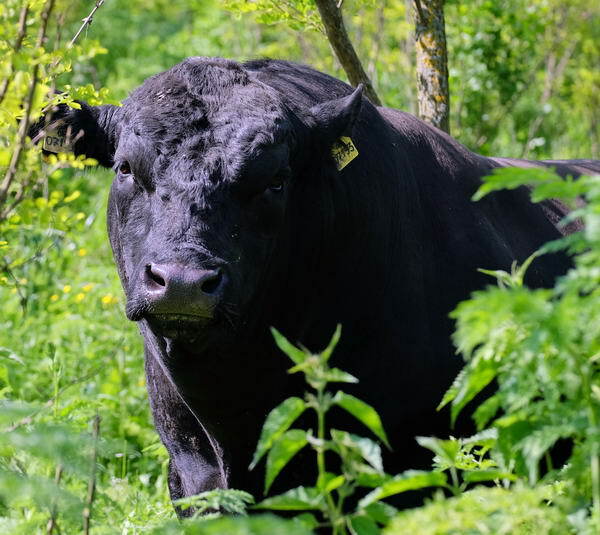 Our beef is obtained in a natural and healthy way, from Angus cattle reared in a low-stress environment. The entire production of beef is fully controlled, from calving to beef delivery to our customers, therefore enabling complete traceability. High-quality beef begins with top genetics, and along the entire production process we aim to develop the quality of our beef. Quality development is implemented from calf birth (calf being suckled by its mother for up to 7-8 months), extensive free-range grazing, natural forage produced on the farm and fattening forage recipes carefully selected according to the principles of sustainable farming. What makes Angus beef special is its degree of marbling, tenderness, juiciness and unique taste. On our farm we achieve all of these by carefully overseeing and respecting all stages of production. Our beef comes from Angus calves and is sold fresh or dry-aged.